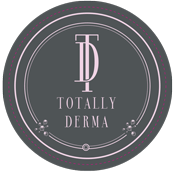 The following information relates to clinical studies conducted using Arthred ®, the superior quality hydrolysed powdered collagen found in Totally Derma®. The clinical data is focused on highlighting the benefits of Arthred ® in cartilage and joint health. Arthred ® is well researched and clinically reported to support, maintain and promote cartilage tissue throughout the body. Results from in vitro studies, preclinical research, and clinical studies in generally healthy populations are discussed. The results should be regarded as preliminary in many of the considered areas. As with all emerging science, the information and interpretation of the data may change with further research. Thus, this science review is offered for your information and consideration. Early protection of cartilage is very important to ensure its health over time. 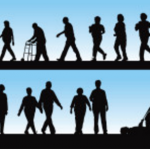 Everyone is at risk of decreasing joint health as a result of the natural ageing process, environmental influence, and congenital or inherited factors. 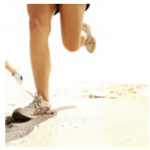 Individual lifestyles that may influence joint health include obesity and strenuous physical activities, e.g. professions involving activities, exercises, or sports that continually stress joints or cause injury. Proper nutrition, lifestyle choices to maintain or achieve a healthy body weight, and protection from abrasion with exercise, rest, and relief from stress are important factors in maintaining joint health [1, 2]. In addition, cartilage should be stimulated to regenerate itself as much as possible . What Is Arthred® hydrolyzed collagen? Arthred® hydrolyzed collagen is produced by enzymatic hydrolysis of collagen from the hides of German cattle under controlled conditions . Hydrolyzed collagen or hydrolyzed gelatin is a special type of gelatin with a much lower molecular weight (MW). This enzymatic hydrolysis process yields short-chained peptides having a low mean MW of approximately 3 kilodaltons (kDa) (mean chain length of 25 – 30 amino acids). Upon further processing, the product is spray-dried into an agglomerated form which offers excellent solubility. Because it is sourced from animal collagen, the amino-acid composition of the peptides resembles that of collagen in human articular (joint) cartilage. The product has a high content of the amino acids hydroxyproline and hydroxylysine as is characteristic of collagen. The predominant amino acids in Arthred® hydrolyzed collagen – glycine, proline, hydroxyproline, lysine, and hydroxylysine – comprise approximately 50% of the substance, by weight. Joints are movable interfaces between bones. They are intended to enable a high degree of mobility but, at the same time, must ensure adequate stability. 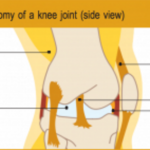 There are different types of joints for different types of movement. Ball-and-socket joints, such as the hip and shoulder, allow full rotation of the joint; hinged joints, such as the knee, allow movement in back and forth directions (See Figure 1). Muscles and ligaments hold the bones in place and allow joints to bend and move as nature intended. Tendons are tough, fibrous cords that connect muscles to bones. Together, tendons, ligaments, and muscles help to control and support the joints while allowing movement and range of motion. In general, joints consist of two or more bone ends, a rounded ball and a hollowed counterpart that fit together . Both bones are coated with a smooth, elastic layer of cartilage that protects the joint cavity. Since cartilage contains no blood vessels, the synovial fluid, which bathes the cartilage, supplies it with nutrients and removes waste. The synovial membrane (synovium) produces the synovial fluid which is continually renewed so it can provide continuous lubrication between the opposing layers of cartilage. Cartilage is composed mostly of water, as well as other components such as collagen, proteoglycans, and chondrocytes described below (See Figure 2). This fibrous extracellular protein is the building block of skin, tendons, bones, and other connective tissues. In cartilage, the predominant collagen is collagen type II which has a triple-helical conformation and forms a meshwork that offers support and flexibility to joints. The basic structure of these macromolecules includes a core protein with at least one (but frequently up to tens or hundreds) carbohydrate chain, the glycosaminoglycans. In cartilage, strands of proteoglycans and collagen are interwoven to form a meshwork that allows cartilage to flex and absorb physical shock. These cells are embedded in cartilage and help cartilage to grow and remain healthy. Chondrocytes synthesize collagen and proteoglycans that form the extracellular matrix – the basis of the cartilage tissue. Cartilage remodeling with continuous turnover of collagen and proteoglycan components may be more dynamic than traditionally thought. 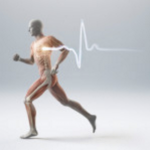 Anabolic (regenerative) and catabolic (degenerative) processes normally balance to ensure homeostasis in response to conditions such as altered gait, weight distribution, traumatic injury, and others . However, many lifestyle choices lead to scenarios where joint disuse, overuse, and/or stress can contribute to increased catabolic processes that are not fully ameliorated by the homeostatic anabolic processes . As a result, a continuum of joint health is possible among the generally healthy human population. Preliminary evidence suggests Arthred® hydrolyzed collagen may help to support the re-synthesis and preservation of cartilage and, thus, maintenance of joint health in light of some of the effects associated with normal abrasion of the joints . The term bioavailability describes the degree to which a substance can be absorbed and is available to interact in metabolism. The bio-availability of protein from protein fragments is influenced mainly by size and amino-acid composition. Absorption and distribution of Arthred® hydrolyzed collagen clearly differs from that of free amino acids and, due to its low mean MW (2-3 kDa), from that of conventional collagen (30-90 kDa). As a concentrated source of typical collagen amino acids (glycine, proline, hydroxyproline, lysine, and hydroxylysine) and peptides, Arthred™ hydrolyzed collagen helps to supply them to collagen-containing tissues, such as cartilage, throughout the body . Oesser et al. (1999) investigated the time course of hydrolyzed collagen absorption as well as its subsequent distribution in various tissues and organs in mice . Absorption of 14C-radiolabeled hydrolyzed collagen (14C-radiolabeled proline peptides, approximately 3 kDa MW) was compared to that in a control group (14C-radiolabeled proline, as collagen-specific free amino acid, plus unlabeled hydrolyzed collagen). Ninety-five percent of orally administered hydrolyzed collagen was absorbed within the first 12 hours. Hydrolyzed collagen was not only taken up in the form of free amino acids, but also as peptides of 2.5-15 kDa MW-differentiating it from free amino acid sources. The distribution of labeled hydrolyzed collagen in the various tissues was similar to that in the control group (14C-proline plus hydrolyzed collagen) except that there was a pronounced and continuing accumulation of 14C-hydrolyzed collagen in cartilage. 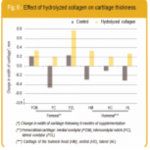 The measured radioactivity was more than twice as high in cartilage following 14C-hydrolyzed collagen administration compared to the control group (14C-proline plus hydrolyzed collagen) indicating that hydrolyzed collagen preferentially accumulated in cartilage tissue (See Figure 3). In addition, the lack of difference in accumulation of radioactivity in the liver (the main organ of metabolism) between 14C-hydrolyzed collagen compared to 14C-proline led to the conclusion that differences in metabolism could not explain the preferential accumulation in the cartilage. This study suggests that collagen hydrolysate accumulates in cartilage and may be involved in a feedback loop that helps to regulate chondrocyte metabolism. This may be relevant to the human body when joint cartilage homeostasis not optimal. Additional research is needed to identify the exact mechanisms of the preferential accumulation. 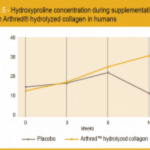 Hydroxyproline is one of the main components of Arthred® hydrolyzed collagen and is therefore a good marker whose uptake can be quantified in blood serum . The absorption of short-term orally-administered hydrolyzed collagen was measured by a single supplementation of 10g Arthred™ hydrolyzed collagen. When compared to a standard diet control without hydrolyzed collagen, supplementation resulted in a significant increase in collagen- characteristic amino acids like hydroxyproline, hydroxylysine, glycine, and proline in blood serum  (See Figure 4). Beuker et al. (1993) conducted a double-blind, placebo-controlled clinical trial involving 52 student athletes (aged 21 to 27 years) to investigate amino acid concentrations in serum following long-term oral administration of Arthred® hydrolyzed collagen or a standard diet without hydrolyzed collagen (placebo) during exercise . The athletes performed one hour of physical training three times a week during a period of four months. The collagen-specific amino acid hydroxyproline concentration in plasma was continuously and significantly elevated during supplementation with hydrolyzed collagen providing evidence that collagen was absorbed into the bloodstream. 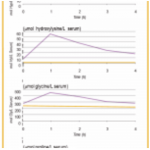 The placebo had no effect on hydroxyproline levels in the blood (See Figure 5). Potential benefits of gelatin (hydrolyzed collagen) supplementation for joint health have been envisaged since medieval times. Hildegard von Bingen (1098-1179) provided the basis for using collagen-containing preparations . In the more recent past, several clinical trials have suggested that supplementation with hydrolyzed collagen may be helpful in reducing pain and improving functional ability in joints among people with unhealthy, arthritic, or degenerative joints. However, these studies are outside the scope of this review as they were conducted in populations that cannot be regarded as generally healthy due to confirmed diagnosis of degenerative joint diseases. The most recent clinical studies provide the first indication of the ability of hydrolyzed collagen to support more normal joint function and cartilage homeostasis. This clinical research has been conducted among generally healthy athletes providing preliminary evidence that hydrolyzed collagen may help in the maintenance of healthy cartilage homeostasis. Among healthy, competitive Spanish male mountain bikers (n=16) and female basketball players (n=10), Fernandez and Perez (1998) examined the effect of hydrolyzed collagen (also called hydrolyzed gelatin) on shoulder and knee joints. Subjects consumed hydrolyzed collagen (10g/day) enriched with magnesium, vitamins B1, B2, B6 and pantothenic acid for a six-month period . After supplementation, biometric ultrasound values of the cartilage showed statistically significant increases of cartilage thickness in supplemented athletes while control subjects exhibited either no change or decreasing cartilage thickness (See Figure 6). This indicates that enriched hydrolyzed collagen may help maintain cartilage homeostasis and joint health among athletes whose joints have been stressed through competitive athletic performance. In another study, Flechsenhar (2005) examined 84 German athletes (average age 41 years) who consumed 10g collagen hydrolysate per day for 12 weeks . The study population consisted of athletes who were generally healthy, participated in a variety of performanceclasses, and had painful joints (knee, hip, shoulder). Excluded from the study population were athletes 1) with an acute injury or inflammation change, 2) consuming chondroitin or glucosamine, 3) expecting a change in analgesic or anti-inflammatory therapy, or 4) suffering from diagnosed disease. After 4 to 6 weeks and at the end of the study period (12 weeks), measurements of pain, restriction of movement, and inflammation were measured. In most instances, knee, hip, and shoulder pain at rest and during test exercises was reduced with hydrolyzed collagen supplementation . Clark et al. (2008) investigated the effects of collagen hydrolysate on generally healthy and physically active subjects (n=97) competing in varsity or club sports and complaining from joint pain or discomfort . Athletes were excluded from the study population if they 1) did not have joint pain or discomfort, 2) had an acute injury or inflammatory process, 3) consumed chondroitin, glucosamine, or other dietary supplements indicated for joint health, or 4) were likely to increase their dose of analgesics due to severe symptoms of arthralgia. In this 24-week, randomized, double-blind, placebo controlled study, subjects received either 10g collagen hydrolysate per day in a 25 ml liquid formulation or a placebo that contained xanthan. Physician- and participant-assessed joint pain measures assessed by visual analogue scales were improved (clinically and statistically significant) with supplementation of collagen hydrolysate (See Figure 7). The improvement in pain was more pronounced in a sub-group of subjects with knee pain. These results from clinical studies in generally healthy and physically active subjects provide preliminary indication that collagen hydrolysate may promote the healthy functioning of joints under conditions that may be associated with increased catabolic or degenerative processes in cartilage homeostasis. The functional integrity of cartilage is dependent on maintenance of the extracellular matrix, a process controlled by articular chondrocytes as previously described. Oesser and Seifert (2003) investigated the effect of hydrolyzed collagen on the formation of type II collagen by articular chondrocytes in a cell culture model . Chondrocytes were cultivated over a period of eleven days. In the presence of collagen hydrolysate (0.5mg/mL) and type II collagen, the articular chondrocytes were able to stimulate type II collagen biosynthesis over the 11-day period. The control, containing native type I and type II collagen in a collagen- free hydrolysate, failed to show any effect (See Figure 8, upper left). These results indicate a stimulatory effect of hydrolyzed collagen on type II collagen biosynthesis of chondrocytes and suggest the need for further testing to determine the mechanisms that regulate collagen biosynthesis. This study and other work by Oesser (Bello and Oesser, 2006 ; Oesser et al., 1999 ) suggest that collagen hydrolysate is absorbed from the intestine in its high molecular weight form, preferentially accumulates in the cartilage, and is able to stimulate chondrocyte metabolism. Oesser and colleagues speculate that collagen hydrolysate may be useful as an oral supplement to activate collagen biosynthesis in human chondrocytes in conditions where cartilage is stressed and joints are painful. They further identify individuals who may experience joint stress, discomfort, or pain as including individuals age 50 and older, active and vigorous athletes, individuals engaging in repetitive motions, and individuals who are overweight, a more cathartic state. Ten grams of Arthred® hydrolyzed collagen, in powder form, mixed into a glass of juice or water is the suggested daily intake. This amount has been shown to be well tolerated in preliminary clinical trials. Supplementation with Arthred® hydrolyzed collagen daily may help to provide the body with nutritional support for joint function when joints are stressed in daily activities to maintain joint health in a population with healthy joints. However, more studies are needed to confirm these potential health benefits of hydrolyzed collagen among individuals with healthy joints. Non-gelling – due to low mean MW (See Figure 10). Water soluble – contains fine-grained granules that dissolve rapidly in cold or warm water without forming clumps; forms a yellowish clear solution (between pH 5 and 6.5) (See Figure 11); works well for carbonated and instant beverage applications. The raw material for Arthred® hydrolyzed collagen is sourced from German cattle. Raw materials used in the production of Arthred™ hydrolyzed collagen originate from healthy animals that have been approved for human consumption by the relevant regulatory authorities. The manufacturing process for hydrolyzed collagen is well-controlled leading to a product that meets food grade specifications (See Figure 12). The FDA recognizes hydrolyzed collagen (gelatin) as GRAS (Generally Recognized as Safe) when used in accordance with Good Manufacturing Practices [15,16,17]. In addition, the Scientific Committee on Food of the EU (European Union) confirmed in 2002 that gelatin (hydrolyzed collagen) is safe for human consumption provided it is manufactured according to good hygiene practices . Additionally, the European Food Safety Authority (EFSA) confirmed the safety of hydrolyzed collagen or gelatin from cattle . Arthred® hydrolyzed collagen has short-chain peptides of low mean MW of approximately 3 kDa (mean chain length of 25 – 30 amino acids). Due to its source, the amino-acid composition of Arthred® hydrolyzed collagen resembles that of collagen in articular cartilage which is characterized by a high proportion of hydroxyproline and hydroxylysine. Arthred® hydrolyzed collagen is well-absorbed and the results of a study in mice suggests it accumulates in cartilage tissue. 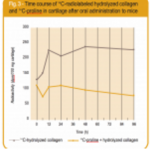 Preliminary results on the biometry of cartilage of competitive athletes indicate that hydrolyzed collagen, such as Arthred® hydrolyzed collagen, might support joint maintenance in generally healthy, physically active individuals. In vitro studies indicate a possible stimulatory effect of Arthred® hydrolyzed collagen on the type II collagen biosynthesis and secretion in chondrocytes. A 10 g intake of Arthred® hydrolyzed collagen per day is suggested based on the available data. Arthred® hydrolyzed collagen is stable and readily soluble by stirring into cold or warm water. It does not gel in concentrated solutions. Hydrolyzed collagen is confirmed as GRAS by the FDA and safe for human consumption by the Scientific Committee on Food of the European Union. The statements in this brochure have not been evaluated by the Food and Drug Administration or EU regulatory authorities. This product is not intended to diagnose, treat, cure, or prevent any disease. 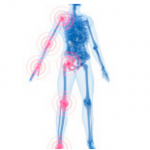 National Institute of Arthritis and Musculoskeletal and Skin Diseases. Handout on health: osteoarthritis. NIAMS, National Institutes of Health web site. http://www.nih.gov Accessed April 14, 2008. Weh, L. 1999. Was ist dran an der Gelatine?, (What’s next for gelatin?). Extracta Orthopaedica. 5:15-7. Eggersgluss, B. 1999. Gelatine Hydrolysate and its Health Aspects. Eur Food Drink Rev. Autumn. Otterness, IG, JD Eskra, ML Bliven, AK Shay, JP Pelletier, and AJ Milici. 1998. 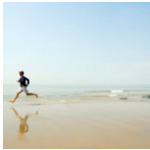 Exercise protects against articular cartilage degeneration in the hamster. Arthritis Rheumatism. 41:2068- 76. Kasper, H. 2003. Nutrition and degenerative joint disease: the chondroprotective effect of gelatine. Med Welt. 3(54):47-9. Oesser, S, M Adam, W Babel, and J Seifert. 1999. Oral Administration of 14C labeled gelatin hydrolysate leads to an accumulation of radioactivity in cartilage of mice (C57/BL). J Nutr. 129:1891-5. Greiling, H and HW Stuhlsatz. 1998. Personal Communication..
 Beuker, F, P Stehle, M Ritsch, and H Theel. 1993. The influence of regular gelatin substitution at the amino acid levels in blood plasma. Ernährungs-Umschau. 40: 64. Fernandez, JL and OM Perez. 1998. Effects of gelatine hydrolysates in the prevention of athletic injuries. Archivos de Medicina del Deporte. 15:277-82. Flechsenhar, KR and D Alf. 2005. Results of a postmarketing surveillance study. Orthopaedische Praxis. 41:486-94. Clark KL, W Sebastianelli, KR Flechsenhar, DF Aukermann, F Meza, RL Millard, JR Deitch, PS Sherbondy, and A Albert. 2008. 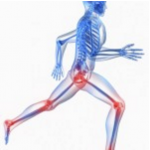 24-week study on the use of collagen hydrolysate as a dietary supplement in athletes with activity-related joint pain. Bello, AE and S Oesser. 2006. 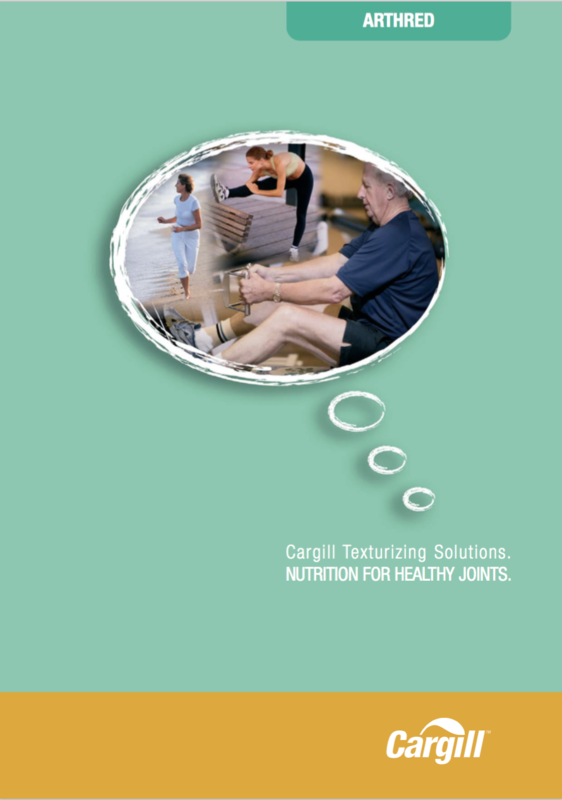 Collagen hydrolysate for the treatment of osteoarthritis and other joint disorders: a review of the literature. Curr Med Res Opin. 22:2221-32. GRAS Notice No. GRN 000021, July 29, 1999.